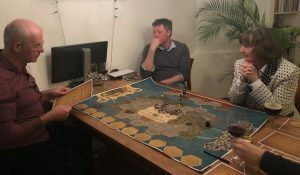 On March 15, 2018, the second playtest of Preservia took place. Preservia is a new board game about digital preservation. Half past five. Together with my colleague Pepijn Lucker, I travel from the National Archives of the Netherlands to Voorburg. Marcel Ras (Digital Heritage Network) lives there and kindly offered to be our host. Because I want to have the game ready before the players arrive, Pepijn and I leave on time. The scheduled playing time is from six to half past seven. According to the public transport information, Marcel lives closer to our bus stop than to Voorburg’s train station, and it is raining. Choosing the bus does not seem to be a good idea, because the traffic in The Hague is jammed. The eight minute bus journey takes half an hour. When Pepijn and I eventually arrive at Marcel’s, Frans Neggers (Het Nieuwe Instituut) is already present. Barbara Sierman (National Library) also arrives. (She does not like playing games, but makes an exception for Preservia.) I ask the players to take a seat in the seating area. While they have a drink there, I prepare the game on Marcel’s spacious kitchen table. After some small chat, wine, beer, and ordering pizza, we go to the kitchen table for a game of Preservia. We play the game, with a break for pizza (and more drinks). I developed Preservia for the Learning Preservation course of the Digital Heritage Network. When I, as a course coach, wondered if we could ‘gamify’ digital preservation, I discovered the Monopoly-based game CURATE: The Digital Curator Game. Now I am not such a fan of Monopoly, but I do like Settlers of Catan and The Legends of Andor. CURATE also seems to be focusing more on the challenges of curation projects, and not so much on preservation and policy. Please note that I’m not judging CURATE. If anything, it inspired me to create a more fantasy-styled game about digital preservation. Other sources of inspiration for Preservia are the ISO 14721: 2012 OAIS reference model, the SCAPE Policy Framework, Vint Cerf’s Digital Dark Age – which Preservia slid into – and the Inkarnate.com website. So bubbled up Preservia. The first playtest was held with colleagues from the National Archives. This provided the first feedback for improving the game. I glued on extra ‘roads’ and it is now possible to ‘trade knowledge’. The first playtest resulted in two winners and the first two secretaries of state for sustainable accessibility in the country of Preservia. The honour roll consists of: Wim Westland and Tom Derks as first secretaries of state for sustainable accessibility, ‘succeeded’ by Marcel Ras. Preservia requires additional playtesting. 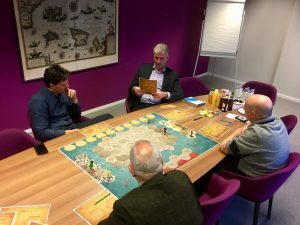 According to a recent newspaper article (in Dutch), a board game has been playtested a thousand times before going into production. Preservia is not meant as a commercial game, and I will not test is a thousand times, but two playtests is not enough. Additional playtesting will improve the game, and make it more fun. Version 1.0 should be ready for (the game room of) iPres 2018 in Boston. Colleagues from the National Archives and the Digital Heritage Network are interested in joining playtests. Do you want to participate, or do you want to contribute in another way to the development (and translation) of the game? Please let me know. Preservia has been accepted for the game room of iPRES2018!